WASHINGTON--(BUSINESS WIRE)--August is Tree Check Month, the peak time of year when the Asian longhorned beetle (ALB) can be found, and the U.S. Department of Agriculture’s Animal and Plant Health Inspection Service (APHIS) is asking residents to help eradicate this invasive pest by looking for signs in their trees. APHIS and local agricultural departments need to be made aware of any infested trees and new outbreaks, so they can be quickly contained to keep the beetle from spreading. The ALB has the potential to destroy millions of acres of America's treasured hardwoods, including maple, birch, elm, willow, ash and poplar trees. The beetle is slow to spread on its own during the early stages of an infestation, so early detection and reporting is critical to containing it. People can also help by not moving firewood, which can transport the beetle hidden inside to new areas. Round exit holes, dime size or smaller, in tree trunks and branches. Sawdust-like material on the ground around the tree or in the branches. Report findings by calling 1-866-702-9938 or completing the online form. 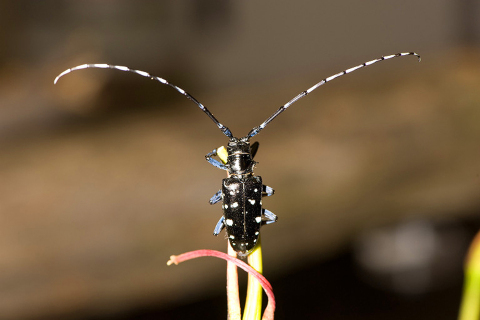 The Asian longhorned beetle, an invasive insect from Asia, has no natural enemies here. It has led to the loss of more than 160,000 trees in forests, parks and neighborhoods. Once infested, trees will die and need to be removed. The ALB Eradication Program began upon detection of the beetle in 1996 in Brooklyn, N.Y., and is a cooperative effort between Federal and State agencies to identify and eradicate ALB infestations in the U.S. To date, the Program has eliminated infestations in Illinois, New Jersey, New York (Manhattan, Staten Island and Islip) and Boston. Current beetle infestations are being fought in Kings, Queens, Nassau and Suffolk Counties, N.Y., Clermont County, Ohio, and Worcester County, Mass. August is Tree Check Month, a peak time to see Asian longhorned beetles, which kill trees. USDA asks residents to help eradicate this invasive pest by looking for and reporting signs in their trees.